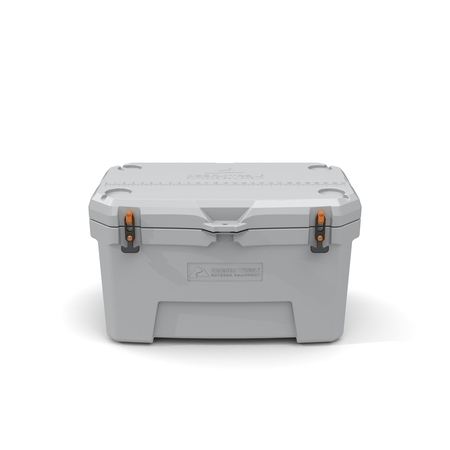 Keep your food secure and chilled with the Ozark Trail 52-Qt High-Performance Cooler. The insulation keeps ice from melting for more than seven days for long-lasting storage. This heavy-duty cooler's seamless, one-piece construction holds up to rugged use. It also offers a whole range of handy utility features. Use the built-in bottle opener to easily pop the top of a frosty drink. Then place your beverage in one of the four convenient drink holders situated on the lid for a portable table space. The oversized drain lets you quickly empty out stored liquids. It even includes a built-in fish ruler on the lid to measure your big catch before you store it inside. Keep your rotomolded cooler in one place with the reversible anti-skid and anti-glide feet, and transport it comfortably using the heavy-duty handles. Finally, enjoy peace of mind with a design that is certified bear resistant. Where has this cooler been all my life? I was excited for my Ozark Trail 52-Quart High-Performance Cooler, Grey to arrive as the cooler I had is nearly half the size of this monster. Right out of the box I was impressed and wanted to snap pictures. What struck me first though, was how heavy the lid was. It seems like it's made of great quality items and much better than the one I have now. As I live in Florida and we have hurricane seasons, coolers are a must for every household. Not to mention, using them for the beach, camping and picnics we all have year-round. I'd say this thing would be incredible durable, and very heavy especially when full of ice, food and drinks. I don't think anyone would be disappointed with this cooler, it even has a wire rack that sits inside to keep smaller things from being in the ice and water. Wow, wow, wow! This cooler looks intimidating and impressive! Simply put - it looks heavy duty and like it puts its rivals and competitors to shame. It's not only impressive with it's appearance, it impresses with its performance as well. This cooler is super sturdy and well made. It isn't too heavy on its own, but once it's loaded with beverages and ice, the comfort grip handles will be a welcomed relief once you start lugging this around. A few features I love on this cooler are the wire basket inside, the t-handle latches, the cup holders on top of the cooler, and the measuring tool on the cooler as well - nice little touch! Although the cup holders on top of the cooler are a little shallow, they're a thoughtful touch, and they come in handy. I used this cooler as a mini-fridge on a recent road trip. My friend and I loaded the cooler with lunch meat, condiments, fruits, and veggies and hit the road. This cooler had more than enough room to accommodate our food and drinks. Not only did the food stay cold for DAYS, the ice barely melted. We lugged this into our hotel room and didn't even bother unloading our food into the mini-fridge; we had that much confidence in the cooler. The weather was warm, but the inside of the cooler was ice cold. I am so impressed with this cooler, and I look forward to using it for years to come! This cooler is amazing! We are loving everything about it. First of all it came quickly and packaged very well. It is extremely durable and well made. We are not people who fish but having the ability to measure fish on top of the cooler, for people who do, is pretty cool. The bottle opener is in the front where there is also the option of putting a lock on the cooler too. The latches to keep the cooler closed are rubber and we thought we'd be a bit concerned about those wearing over time but they are very thick and I can't imagine it's something that would happen any time soon. The walls are thick and definitely keep our drinks cold for a long period of time although we haven't used it for over 48 hours yet. It held up that long for us though. The handles are neat because they are on nylon so they are flexible which is much more comfortable than the standard handles which have no give. The drain on the side is on a chain which is nice too in comparison to the typical plastic part that keeps those affixed and tend to break off. The cup holders on top work well and are a great convenience. We are very happy with this cooler and will be sticking with this brand for sure. They seem very in tune to what people actually need in a product. I received the Ozark Trail 52-Quart High Performance Cooler from Spark Reviewer in exchange for my honest opinion. First of all, this cooler is heavy without anything in it and it's even heavier once filled. You will definitely need some muscles to carry this cooler. It's very well constructed. It comes with 4 cup holders on the lid which will fit a 20 or 30 oz cup. It has a large drain that allows you to drain cooler quickly. For those that love to fish, there's a ruler made into the cooler to measure your big catch. I think that's pretty neat. The inside is very spacious and it includes a basket to separate your items. There is also a built in bottle opener that can be found in the front of the cooler. Please make sure you keep the lid closed because my husband bumped into the bottle opener and cut his leg. It's very sharp. The cooler kept my items cold and the ice stayed in the cooler for 6-7 days. I would strongly recommend this cooler to anyone looking for a reasonably priced cooler. This may be the only cooler you would ever need for camping, boating, fishing or backyard gatherings. This is truely a high performance 52 quart cooler with great extras. Had it on the back of my truck bed and it stayed in place with no sliding. It has a very tight seal with the T-handle Latches that makes it harder for My younger kids to open when I need to keep them out. Or you can simply put a lock on the stainless steel locking plate. It can be carried by a single person but once you start packing this thing up with goodies it wont be easy. So the heavy- duty handles with comfort grips came in handy when we had to walk from the car to the park with two people carring this. It has a fish ruler and four tumbler size cup holders on top. It also has an oversized drain and a bottle opener attached to it. I worked out of town for a week and used this as a mini fridge with its very large space and wire basket inside. So if you follow the directions for best results, and the ice packing guide your cooler should keep ice for seven days. I tried this and tested it for five of the 7 and it worked great making my cheap hotel room much more convenient. This has been absolutely the best cooler I have ever used or owned and I have had a few.